I can’t stress the importance of backing up your data and image files as in the past I’ve been guilty of not doing this on a regular enough basis, and I have almost paid the price. I went for years without any hard drive failures at all, and was lured into the false sense of security that these devices were almost infallible. However, in the last year I’ve had 4 hard drives fail, and these were not some cheap makes either. I’ve had 2 external hard drive system crater, a 320 GB LaCie drive and a Western Digital 1.0 TB MyBook. Recently I’ve had a relatively new Seagate Barracuda fail in my Desktop and I lost my whole system. The makers replaced this under warranty but it left me without my main PC for some time and a further several days re-installing all my software. On top of that a hard drive failed in a Toshiba Satellite notebook at work. All this has made me totally rethink my back up strategy and change my set up. External hard drives seem relatively cheap these days and present a very attractive option for back up and storage, with 1.0 TB drives selling for as little as £80 here in the UK and $100 in the US,. Having 3 such devices had worked fine for me for quite some time. However the recent problems and having over a Terabyte of image files and growing, a major reassessment was due. I looked at various RAID arrays, NAS units and even Home servers as options, but all seemed overly complicated. I wanted something I could just plug in and my photo’s would be protected, irrespective of drive problems. 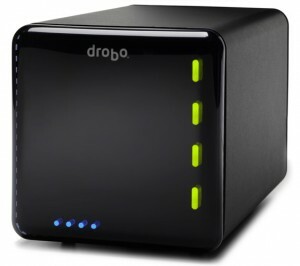 Then I found the Drobo. Made by Data Robotics Inc., the Drobo is a sleek, black, metal housing (smaller than a shoebox), that holds up to 4 Sata hard drives that you can simply slide straight in by removing the magnetically held cover on the front. Not only does it look cool, you can mix and match drives and capacities and all your data is protected even if a hard drive fails. It even warns you if a drive is having problems and needs replacing. Run out of capacity; simply pull out a drive and add a larger one. When I first saw these I thought yes, that’s exactly what I need, then I saw the price, over £500 in the UK and that was without any drives. Well some time has passed since then and Drobo version 2 is out which supports firewire 400/800 as well as USB 2.0. The good news is that they are easily available in the UK and prices have fallen significantly. There are still not cheap min you, but with the fall in HD prices and my recent problems I bit the bullet and order one. I’m not going to give a review of the Drobo here; there are plenty of other sites you can google that present in-depth reviews and all the technical details. Suffice to say, I’ve been living with my Drobo for a few months now and it has performed flawlessly. It’s so simple to set up, just turn on and add the drives. I have mine populated with a few Samsung Spinpoint 1.5TD Eco Green drives and 0.5 TB drive I rescued from the remains of 1.0 TB WD MyBook that failed. It comes with a simple but adequate back up program, and Drobo dashboard, a small footprint, memory resident program, that monitors the Drobo and your drive space. I have my Drobo configured as one single 16 TB drive (the maximum), which is what Windows Vista sees the drive as, although I don’t have anywhere near 16 TB installed. Hence I can add more drives when I need more space. It’s that simple. I wonder why nobody has come up with a system like this before, it’s simplicity itself. Now wouldn’t it be great if all PC’s had this built in. Just think, no more opening up the PC cases, installing additional drives, fiddling around with small screws and cables, formatting. You could just open a door and slide in another drive….now there’s a thought. If you a professional photographer, or have loads of images and/or data files, then this could be the device for you. There are much faster devices out there, but this is no slouch either. It certainly gets my recommendation.